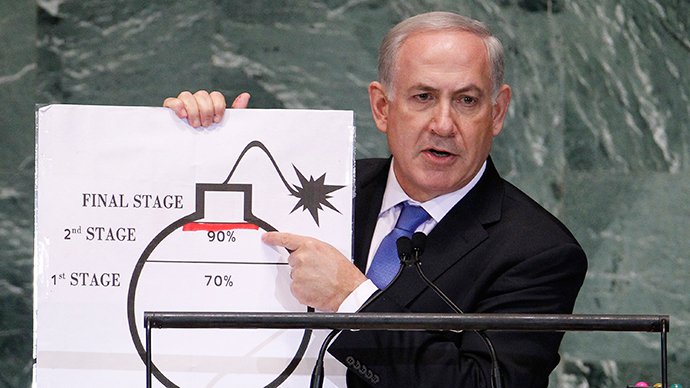 While debate over a nuclear deal with Iran continues, the White House used a cartoon bomb to demonstrate the benefits of the framework agreement struck with Tehran – a move that was surely meant to tweak Israeli Prime Minister Benjamin Netanyahu. Netanyahu has been a fierce critic of the framework deal hammered out between Iran and leading world powers earlier this month, but on Wednesday the Obama administration used his own imagery against him as it tries to convince Americans that the deal being worked on is the best way to prevent Tehran from obtaining a nuclear weapon. The tweeted image explained several aspects of the framework deal, including the fact that Iran agreed reduce the amount of centrifuges it operates by 66 percent and not produce or stockpile highly enriched uranium. Netanyahu’s ‘red line’ is still present, though the US administration uses it to argue that Iran would reach the nuclear threshold without the diplomatic solution. A blue line, meanwhile, can be seen at the bottom of the bomb indicating that, with the deal in place, Iran would have zero percent chance of obtaining a nuke. Since the framework for a nuclear deal was presented by the P5+1 (the US, UK, France, Russia, China and Germany) and Iran, Netanyahu has blasted the accord, saying it would “threaten the survival of Israel” if finalized. President Barack Obama, however, has pushed back strongly against opponents of the deal, arguing that it is the best way to ensure Iran does not try to obtain a nuclear weapon. Obama also reiterated the US’ longstanding support for Israel and its security. “The most important thing for Israelis is to know that they can defend themselves, and that they have America – the world's most powerful country – there to protect them alongside their military and their intelligence operations,” he said to NPR Monday.